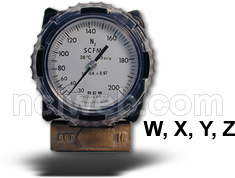 Differential Pressure measuring principle avoids problems associated with sticking floats and plugging passages. Low maintenance design with no moving parts. Intrinsic safety option for Class I Div. I, Groups A,B,C,D; Class II Div 1, Groups E,F,G; EExia IIc T4 (CSA and Cenelec approvals pending). 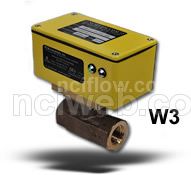 The W2 option includes a mechanical analog indicator with the solid state strain gauge mounted on top sensing the differential pressure directly and providing a loop powered 4-20mA signal proportional to flow squared (r²). 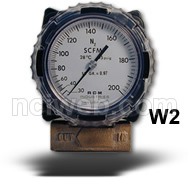 The New digital display flow meter is a 2 wire loop powered 4-20mA DC indicator that displays a flow rate and total. On-screen engineering units are easily configured. Password protection and 16 bit A/D resolution. A New built in wet/wet differential pressure sensor is protected by an isolated stainless steel diaphragm and provides a 4-20mA DC signal to the display. The enclosure is IP67 / NEMA 4X rated which further enhances this models capability. Available in threaded or flanged connection and bronze or stainless steel construction. Economical single package solution for monitoring flow to a remote control room. A solid state strain gauge senses the differential pressure directly which provides a loop powered 4-20mA signal proportional to flow squared (r²). 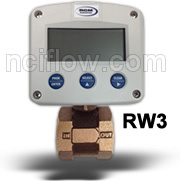 The flow meter is available with either a 4-20mA output (Option W), a 0-1000 Hz frequency (Option Y), set point switching (Option X) and Option Z which combines W, X, & Y for interfacing with controllers, computers and alarms. The output signal is linear. Accuracy Horizontal Flow ±3% F.S. above 30% F.S. ±3% F.S. above 15% F.S. Accuracy Vertical Flow ±5% F.S. above 30% F.S. ±3% F.S. above 15% F.S.